Let’s not be coy here, Schtum is a silly band name. Formed in Derry, Ireland, Schtum were a four piece that played a rocky kind of indie that was probably labelled ‘post grunge’ when it first came out. This is perhaps slightly off kilter when describing their sound. They sound like an Irish Fugazi, and that people is no bad thing at all. Like many of the bands that have been featured in the Box series, this single represents, by far, this bands best moment of music. I am going to stick my neck out and say that this is the best six minutes of music to ever come out of Derry. Schtum revolved around the vocal talents of one Christian O’Neill. They had a minor hit in the 90s with the song ‘Skydiver’ and ‘Big Big City’ was the follow up and is a much better song. The problem with it that at just under six minutes long it was unlikely to ever get much radio play. A shame because I think this would have done quite well had popular radio at the time had the opportunity to play it. Certainly after a couple of reminder plays here this morning, I’ve been humming this ever since. It reminds me of Whipping Boy at their angriest, that is probably the Irish accent in the vocals though. It is a sneering blast, an ode to a home town, warts and all, catchy, angry, noisy, and just ever so slightly better than brilliant. 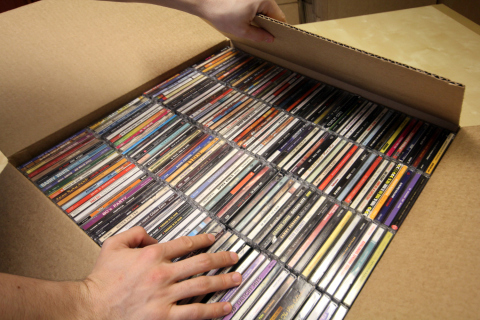 When I pick CDs out of this box, if they are good they go in the loft, if they are bad they go in the charity shop bin at the end of the road. So despite Schtum having one of rock stupidest names, I have been able to ask myself this morning ‘Do you want to keep Schtum?’ to which the answer has to be ‘Yes’. For this is one hell of a single. The one thing worse than the awful name is the joke name, so ladies and gents, here are a band called A. You imagine then guffawing behind the poor sap in HMV who places CDs onto the shelves, s/he finds the little grey border thing with ‘A’ written on it and s/he then gets confused because the band is called A. Oh the hours of laughing that must have caused. A are a punky rock band, who, after playing as Grand Designs (a much better name), changed their name in1993. They originally were a prog rock band but hailing from punk rocks second home of Suffolk public attention demanded that they changed tact to sound more like Green Day, which they manage not to do, but do manage to sound like a more shouty less radio friendly Busted. Considering that nowadays singer Jason Perry is now writing songs with Busted’s and winner of ‘I’m Celebrity Give Me a Low Grade TV Series to Present’ Matt Willis, this is not that surprising. Minor celebrity fact fans will like this bit, the original bassist in the band was a chap called Stevie Swindon, he left the band quite early on and was replaced by a chap called Daniel P Carter. Carter now presents the Radio 1 Rock Show. If that ever comes up in a pub quiz, you are almost certainly drinking in the wrong pubs. So we come to the lost classic. This is a great record by a band that I know very little about. If I was asked to name other songs by Number One Cup I wouldn’t be able to. Wikipedia tells me that they were from Chicago and the singer was a guy called Seth Cohen. I also found out that the band were forced into a hiatus in 1998 when Cohen broke his neck playing hockey, this didn’t surprise me as hockey is bloody dangerous, twenty people running around a field armed with wooden bats and a bloody hard ball. Number One Cup fit in nicely with one of themes running through this box, alt rock from America, they sound like Superchunk, Dinosaur Jr, Buffalo Tom and all those other bands from the mid 90s that arrived on our shores in a post Nirvana wave. Divebomb was a minor hit and was very popular in the indie clubs in the mid 90s, the NME dubbed it a strong contender for Single of The Year, I’ve just checked their archive it didn’t make the Top 50, it should have when you consider that Back For Good by Take That was at Number 47 and Alanis Morrisette at 30. File under ‘Lost Classic’. Oh and the B Side includes a Cover Version, albeit a rather quirky one, so that is this weeks obligatory cover version track. And a series called 40 Albums YOU should hear before I am 40 (which is exactly a year from today). I hope that I can keep this blogging lark up.